Custom Machining Pic Logue Industries is a job shop that provides CNC machine shop services to all industries. Our material inventory is comprehensive to handle a variety of applications (ex: equipment pins and bushings).We also have daily steel deliveries from multiple vendors. 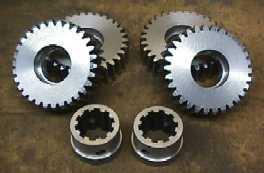 Logue Industries offers:gears_etccone-heavy-mach-1 CNC milling CNC turning & threading capabilities. 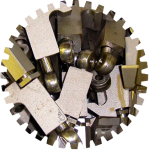 Blanchard grinding services (ex: chipper blade sharpening) General machining services. We can repair, replicate or build new depending on your application. We have a several large capacity machines for heavy machining. CNC Turning Mazak STN-550M (35″ Dia. x 80″ Centers, 12.5″ Spindle Bore, and Live Tooling) (Specs at Mazak.com) Mazak ST-50 – 30″ Dia. x 72″ Centers, 6.5″ Spindle Bore Mazak QT – 11″ Dia. x 20″ Center CNC Milling Okuma MCV-A – 74″ Wide x 118″ Long Table x 42″ Vert. Mazak VQC 20/40 – 20″ x 40″ Table Mazak AVJ 35/60 – 35″ x 60″ Table Bridgeport – 12″ x 24″ Table Grinding Blanchard Surface – 42″ Magnetic Chuck x 16″ Vertical Travel Blanchard Surface – 30″ Magnetic Chuck x 11″ Vertical Travel Grisetti Cylindrical Grinder- 10″ Dia. x 40″ Centers Harig Surface Grinder – 6″ x 18″ Capacity Specialized Metal Cutting Machines Oster Threading Machine – 2.25″ Dia. LaPointe Broaching Machine – 1″ Key Capacity Mitts & Merrill #6 Keyway Shaper – 2″ Key Capacity x 14″ long Fellows Gear Shaper – 18″ x 6″ Face Barber/Coleman Gear Hob – 16″ x 16″ Face Conventional Drilling G&L Radial – 12″ Column x 60″ Arm Arboga Radial – 10″ Column x 36″ Arm Cincinnati Radial – 19″ Column x 96″ Arm Conventional Turning Monarch Engine Lathe – 48″ Dia. x 120″ Centers Monarch Engine Lathe – 12″ Dia. x 20″ Centers Southbend Engine Lathe – 17″ Dia. x 48″ Centers Conventional Milling Carlton Horz. Boring Mill – 72″ Vert. x 168″ Horz. Ingersoll Planer Mill – 48″ Wide x 192″ Long Table – 48″ Vert. Lucas Horz. Boring Mill – 36″ Vert. x 48″ Horz. Cincinnati Horz. Mill – 24″ x 96″ Table Cincinnati Vert. Mill – 24″ x 60″ Table Cincinnati Universal Mill – 10″ x 36″ Table Bridgeport Series II Mill – 15″ x 34″ Table Bridgeport Vert. Mill – 12″ x 30″ Table | Logue Industries, Inc.
Logue Industries is a job shop that provides CNC machine shop services to all industries. Our material inventory is comprehensive to handle a variety of applications (ex: equipment pins and bushings).We also have daily steel deliveries from multiple vendors. We can repair, replicate or build new depending on your application. We have a several large capacity machines for heavy machining. Okuma MCV-A – 74″ Wide x 118″ Long Table x 42″ Vert. Oster Threading Machine – 2.25″ Dia. Carlton Horz. Boring Mill – 72″ Vert. x 168″ Horz. Ingersoll Planer Mill – 48″ Wide x 192″ Long Table – 48″ Vert. Lucas Horz. 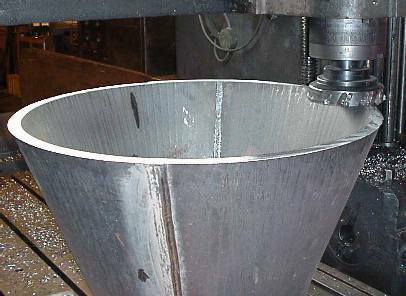 Boring Mill – 36″ Vert. x 48″ Horz.